Why go in spring: Mild weather and a spectacular seaside bike route make this low-key, lost-in-time town ideal for a spring-time pedal. It’s so not: Its famous neighbors, Monterey and Pebble Beach. Local legend: John Steinbeck wrote part of Of Mice and Men here. Most scenic workout: Velo Club Monterey has regular Saturday rides, geared toward fit cyclists, out along 17-Mile Drive (meet at 8:30 a.m. behind Lighthouse Cinemas, 525 Lighthouse Ave.; vcmonterey.org). Fuel up first: Grab a giant chocolate croissant from Pavel’s Backerei (closed Sun; $2.50; 219 Forest Ave.; 831/ 643-2636). Rehydrate with a local brew: The ubiquitous Sparky’s Root Beer. 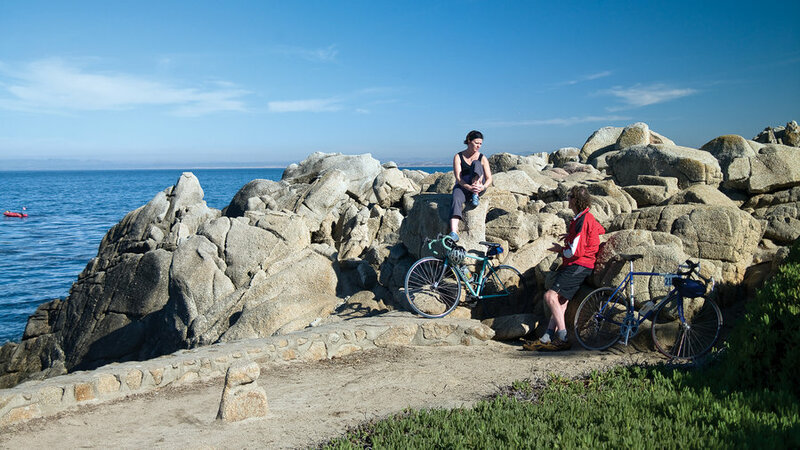 Ride your bike to lunch: Fishwife ($$; 19961/2 Sunset Dr.; 831/375-7107) at Asilomar Beach is casual―bike shorts are fine―and serves reliably good seafood staples. Make it a weekend: Check in at Anton Inn (from $109; antoninn.com), recently remodeled into a chic, contemporary motel. Get a deal on a room Several bayside hotels on Cannery Row in Monterey have put their rooms on sale through the end of March―even the stylish new Intercontinental the Clement Monterey, where guests gather around firepits on the broad deck for cocktails and otter sightings to a natural soundtrack of crashing waves. From $149; canneryrow.com. Check out a new family favorite Locals have already fallen for the MY Museum, recently reopened in a new, bigger space where kids drive a pint-size ambulance, harvest wooden artichokes, and serve up plastic spaghetti in a mini cafe. It’s bound to become traveling parents’ number-two stop after the Monterey Bay Aquarium. $7; 425 Washington St., Monterey; mymuseum.org. Explore an Asian sanctuary The vast, over-the-top Marsh Building, the city’s unofficial landmark, was recently spared demolition and has now reopened as Orientations at the Marsh Building, a lavish gallery of museum-quality Asian antiques. Visit on Saturday, when the tea lounge is open. Closed Sun; 700 Camino El Estero, Monterey; orientations.us.